Britain’s first gas turbine locomotive was ordered by the Great Western Railway in the spring of 1946 from Brown Boveri of Switzerland, the revolutionary new locomotive did not arrive in Britain until February 1950. Today, 70 years later, she lives at the Didcot Railway Centre, and although there is no current prospect of operation, the locomotive is being restored to the original black and silver colour scheme and is to become a key exhibit at Didcot. What an exciting prospect it would be if this jet propelled locomotive could be restored to working order ! But why did railways gas turbines in the later 1940s, when electric traction had already been proved so successful around the world, together with the rapidly growing numbers of diesel locomotives. Gas turbines had been theoretically possible for many years, but the technology needed to create a high velocity jet of air, together with a suitable fuel and combustion chamber was not practical until Sir Frank Whittle’s work was so brilliantly successful in the 1940s. The process takes in air from the outside world passing through a compressor and on into the combustion chamber, where it is mixed and burnt with oil fuel. The burning fuel raises the temperature of the compressed air, causing it to expand very rapidly, leaving the combustion chamber at high speed through the turbine. This jet of air drives the turbine, which in turn, using some of the energy in the stream of hot gas drives the compressor, and the remainder being used to drive a generator. In other examples it could be used directly to drive an aircraft through the air, a ship’s propeller or other fixed machinery. Not quite so simple on the railway. Turbines had been experimented with previously – classic examples being the North British built “Reid-Ramsay Condensing Turbine”, the Beyer-Linjgstrom and LMS “Turbomotive” – but of course these were steam turbines. The higher temperatures, pressures and velocities generated in the gas turbine design demanded a different arrangement to use the energy. The most obvious way to achieve this was to couple the turbine with a generator, to drive the locomotive’s electric traction motors. True to its reputation for individuality the GWR opted for this form of traction after the Second World War, following on a visit made by F.W.Hawksworth and A.W.J.Dymond to Basle in 1946, to see at first hand the Swiss Federal Railways new 2,200hp locomotive. The GWR already had a plan to convert steam locomotives from coal to oil burning, which, with the addition of new oil-fired gas-turbines offered an exciting prospect for the post-war era. 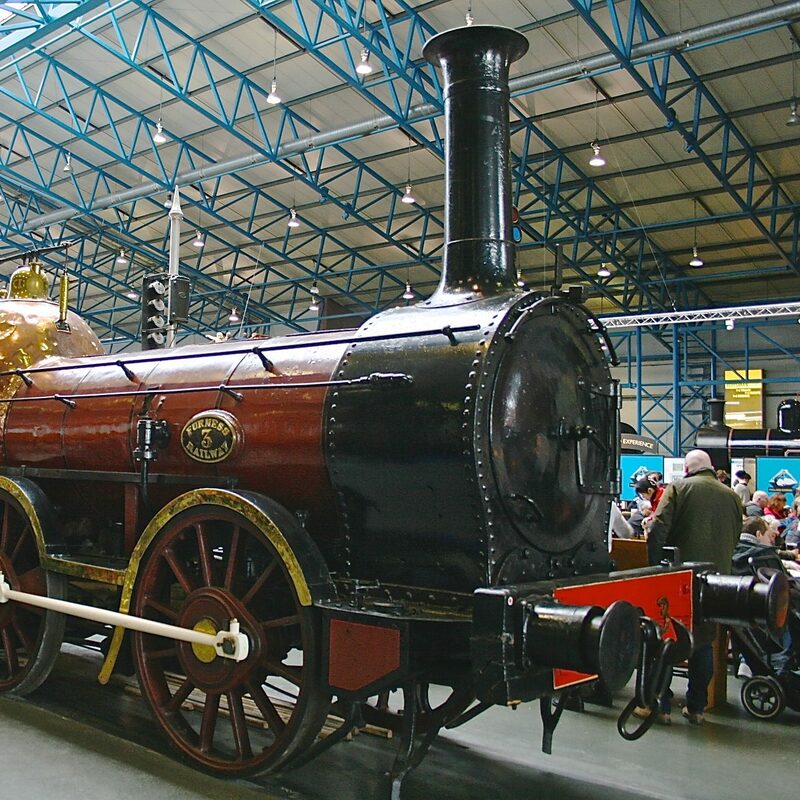 In addition to the order from Brown-Boveri, the GWR ordered a comparable locomotive from Metropolitan-Vickers in Manchester, whose experience in building jet engines for aircraft would be brought down to earth – very literally!! This 2,500 hp locomotive was intended to be used between London and Plymouth, over the legendary South Devon banks, and like the Metro-Vickers design was planned to take 17 and 18-coach trains unaided. Carrying enough oil fuel for a 250 mile trip, the locomotive was capable of 90 mph, with a maximum tractive effort of 31,500 lbs and an all up weight of no less than 115 tons. The Brown Boveri gas turbine was carried on two six-wheel bogies, with only the outer axles on each bogie driven, making the wheel arrangement A1A-A1A in an overall length of 63ft. The mechanical part of the locomotive was built by SLM (Swiss Locomotive Works) at Winterthur, with the two bogies constructed of welded steel box section. This technique was also used for a fabricated platform to carry the body and mounting positions for the power unit, water tanks, lubricating oil and fuel tanks. A separate, auxiliary frame carried the power unit proper, with its three-point suspension, and attached to this platform. Interestingly, although the underframe girders and bogie bolsters, were all welded, the cross bracing was rivetted. Clearly, confidence levels in all welded engineering constructions were still not that high. Powering this locomotive was a single stage open-cycle gas turbine driving a d.c. generator through reduction gearing, just like a conventional diesel-electric locomotive. The generator in turn supplied power to four axle hung traction motors, rated at 397 kW at 720V, 1500 rpm. The final drive to the wheels was by means of a gear wheel driven by the motor pinion through a quill shaft, in turn linking with eight coil springs connected to a final carrier disc attached to the axle. This disc presses onto the spring cups, forming the coupling between the driving gear and the axle – a fairly uncomplicated arrangement !! The whole assembly of gears was protected by a casing, to prevent ingress of dust but providing effective lubrication. The gas turbine power unit consisted of a compressor, heat exchanger, combustion chamber and of course the turbine itself. Air sucked in through the compressor passed through the heat exchanger at a pressure of around 2.5 bar, where the temperature was raised to about 150 deg C. (c. 500 deg F.), before finally reaching the combustion chamber. Here, the oil fuel was mixed with a proportion of the air passing through the heat exchanger, burned and routed to the gas turbine itself. Most of the air bypassed the combustion chamber and was used to reduce the gas temperature entering the turbine from 930 deg C. (c. 3,300 deg F.) to a mere 310 deg C. (1,100 deg F.). In this stage, the expanding gases drove the blades of the turbine and finally out through the roof grilles, after passing through the heat exchanger. The turbine and compressor are mounted on a single shaft, the free end of which provided the output for the generator through reduction gearing to drive the generator. In addition to the main turbine, a separate 150hp Saurer diesel engine was used during startup, driving a smaller auxiliary generator, which could also be used to power the four traction motors at low speeds, useful for shunting operations. This locomotive was ordered at the same time as the Brown-Boveri loco, in order to design and test a British built version, capitalising on the reputation of the Manchester based company in the electrical, railway and more recently jet aircraft engineering field. Like its sister locomotive, No. 18100 was required to haul the heaviest GWR trains on the London to Plymouth route without the usual assistance over the South Devon banks. Metropolitan-Vickers design was quite different from No. 18000, producing some 3,500hp and driving six axle hung, nose suspended traction motors. The final drive, unlike the Brown Boveri design, was a relatively simple spur gear arrangement. So far as the main body of the locomotive was concerned, an almost all welded body and underframe unit was provided with solebars from deep section steel, and a reinforcing plate welded to the top and bottom of each. The body assembly supported the weight of the power plant, fuel tanks, and auxiliary equipment with mounting points for the six-wheel bogies. An interesting method of attaching – suspending is a more appropriate term – the body to the bogies was adopted by Metro-Vickers, using “Metalastik” rubber bonded swing links. This arrangement was also used on Metro-Vick locomotives supplied to the Rede Mineira Railway in Brazil at about the same time. Although use of swing links was not new, the choice of rubber as the material to provide a resilient joint was, and later adopted for many other rail applications. The bogies themselves were fabricated by the Yorkshire Engine Co., together with a sub-assembly fitted to the underside of the locomotive, forming the mounting points for the bogies. With the gas turbine unit itself, the same open-cycle type was installed, although in this example, no heat exchanger was used and the compressor, combustion chamber and turbine stages drove three generators through reduction gears. The design followed the same principles used by the company for the jet aircraft it had been building, with its nominal output of 3,500 hp restricted to just 3,000 hp on delivery. The 15-stage compressor feeding gas at a temperature of about 475 deg. C (1300 deg. F) into six combustion chambers lying parallel to the turbine itself, here the compressed air was mixed with fuel injected into the chamber and burnt. The rapidly expanding gas then passed into the turbine, comprising 5 rows of moving and 5 rows of fixed blades, before being exhausted to the outside world. The end of the turbine shaft was meshed with a reduction gear ratio of 4.375 to 1, to reduce the maximum speed of the turbine (7,000 rpm), and deliver a lower speed of c. 1,600 rpm to the generator shafts. Two of the three main generators were in tandem on the same shaft, whilst the third, together with a smaller auxiliary power generator was arranged on the second shaft. These generators, each of which fed two traction motors, connected permanently in parallel not only provided power for traction, but also, as with the Brown Boveri design, charged the main batteries. However, unlike the Brown Boveri design, no separate diesel engine and auxiliary motor generator set was used to start the locomotive – the main battery was the only source of power for starting. Like the Brown Boveri loco, a separate oil-fired boiler was provided to supply steam heating and, of course the tried and tested GWR audible warning system was fitted. Overall, the Metro-Vick design weighed in at a sprightly 129 tons 10 cwt (131,854 kg if you prefer). Difficulties over the role that railway technical staff and others played in the development of the British design from Metro-Vick meant that the locomotive appeared a few months later than the Brown Boveri version. Some of these difficulties were with the Gas Turbine department and surrounded the translation of an aircraft engine design into one suitable for railway use. As it turned out, the Brown Boveri locomotive took to the rails in February 1950, whilst the Metro-Vick version appeared in December 1951. Neither the Brown-Boveri nor Metropolitan-Vickers had the last say, since by 1960, English Electric & Vulcan Foundry, together with British Railways decided to have one last go at gas turbine propulsion. The result was the ill-fated “GT3” experiment, seen here being built at the Newton-le-Willows works.